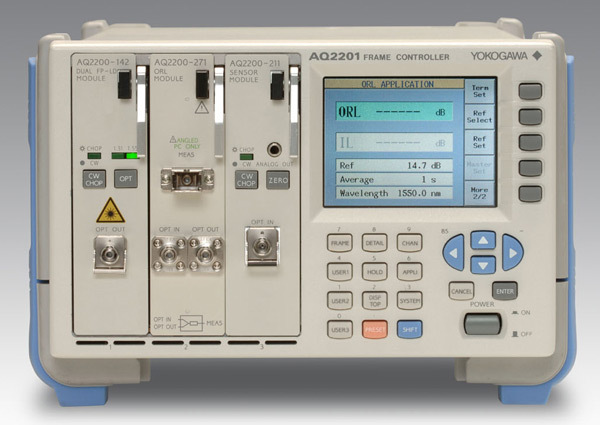 The AQ2201 and AQ2202 frame controllers are platforms for the AQ2200 Multi Application Test System. These frame controllers contain a variety of measurement applications that enable you to get the information you need without connecting an external controller PC. In addition, they have three different external interfaces, so you can always use the best interface for a particular measurement application. The AQ2201 and AQ2202 both have a 320×240-dot, wide-viewing-angle, high-resolution color TFT display for easy viewing. Even detailed graphs are easy to view on this display. The CF card slot makes iteasy to quickly save and load data. Measurements are saved in CSV format, so they can be easily imported into almost any PC application. 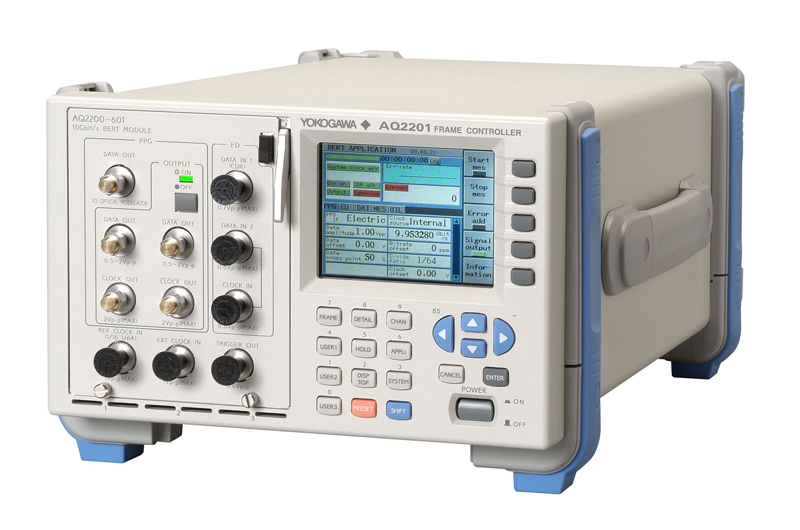 The AQ2201 and AQ2202 support Ethernet as well as GP-IB, which is the standard interface for measuring instruments. Ethernet support makes remote monitoring and control even easier. The AQ2200-211 is a high-speed longwave sensor for theAQ2200 series. The AQ2200-141 and AQ2200-142 provide excellent level stability of ±0.005 dB or better over a 15-minute period and offer excellent stability for all of your measurements. Optical Return Loss (ORL) and Insertion Loss (IL) measurements of Optical Component. Ideal Reference LightSources for Optical Device Measurements. When the modules are mounted in the AQ2200 series frame controllers, it provides a high-output, high-stability measurement. 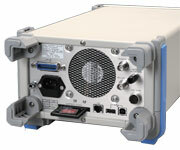 AQ2200-136 TLS module is a tunable light source designed for the AQ2200 multi-application test system. Although it is lightweight with a small, 2-slot module, it is capable of tuning range the 1440 nm to 1640 nm. The AQ2200-141 and AQ2200-142 are FP-LD light sources for the AQ2200 series. When they are mounted in AQ2200 series frame controllers, they provide high-output, high-stability optical output. AQ2200-231 is AQ2200 series longwave large-diameter sensor heads. When they are installed in AQ2200 series frame controllers using the AQ2200-201 Interface Module, they allow optical power to be measured at high speed and with high accuracy. Yokogawa's Optical modulator and optical receiver for 10G BERT module offers high quality features.